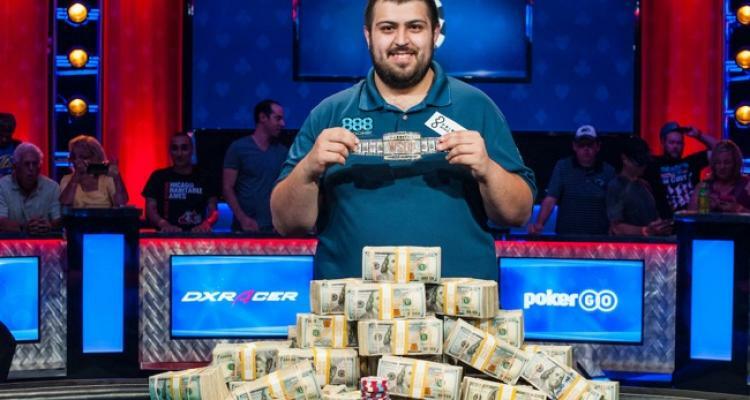 Regulated online poker received a major global endorsement this week after New Jersey native Scott Blumstein won the 2017 World Series of Poker Main Event on Saturday. Blumstein won over $8 million in the event, a feat that he largely attributes to his experience gained playing online poker in the good ol' USA. Blumstein came into the final table as the overall chip leader, looking to win the Main Event event in his first ever World Series. He briefly lost that lead to John Hesp but retook the lead in a massive cooler hand against the popular UK grandfather. Blumstein had pocket aces in a hand against Hesp’s Ah-10h. The flop gave Blumstein a set of aces and Hesp top pair. When the turn fell a 10, Hesp committed his entire stack while drawing dead. Blumstein made the easy call and doubled to 156 million. Afterwards, Blumstein continued to run well but also executed a brilliant strategy on his way to winning the Main Event. He never trailed after his double-up and eventually defeated Dan Ott heads-up early Sunday morning to win the richest prize in live poker. New Jersey is one of three US states that offers regulated online poker. This has allowed Blumstein to practice his craft in a safe environment and helped him to ultimately become the World Champion of Poker. Blumstein told NorthJersey.com, "The best way to get better at anything is through repetition and practice. When you play online in New Jersey, it's hard for any live pro to see even close to the amount of hands I've probably seen in the last two years." According to PocketFives.com, Blumstein has won over $147,000 playing online poker in New Jersey. His largest score came in 2015 when he took down the the Garden State Super Series Event #22 for $20,805. His experience online has paid off previously with a victory in a preliminary event at the 2016 Borgata Winter Poker Open in Atlantic City. He won $200,000 in that event, easily his largest live poker score prior to last weekend. New Jersey is easily the largest regulated market in the United States. It began operation in late 2013 and since that time has grown to the point that it helped AC casinos post their first revenue increase in a decade. The Blumstein story is a boon for regulated online poker and one that it needs as states continue to struggle to regulate the game. Efforts have failed completely in New York and California while Pennsylvania seems to be a longshot at best this year. Continued positive press about players from regulated sites may prove helpful to future regulatory efforts as it shows that there’s strong interest for the game. Also, the added positive attention garnered for a state and its casino industry can also attract new players who want to duplicate the success of others.